Playstyle: Defensive character with mid-range/long-range options. -Boomerang and Whip Swing can go through projectiles and his slide kick can go right under a few of them. -Has one of the farthest-reaching meterless non-projectile attacks..
-Basic attacks have decent reach. -Can't deal well with pressure. -Jump is floatier than most of the characters and he's unable to change his direction during a neutral jump. Back Kick (Down-Back, Kick) - For an anti-air, it has to hit pretty close but it launches the opponent up on hit. Really unsafe on block. Dagger Toss (Hold B, F, Punch or Kick) - Simon throws out a dagger that travels forward. The dagger's speed can be controlled by holding forwards or backwards. Kick version delays Simon's toss. Backflip (Hold D, U, Punch or Kick)- Simon's anti-air move. Simon is invincible during the beginning of this and move slightly backwards upon using it. However, it's quite unsafe on block. Punch version does a shorter hop while the kick version does more damage but has a bit less invincibility. Whip Swing (F, DF, D, DB, B, Punch or Kick) - Reaches pretty far and needs to be blocked high. The whip also has the ability to destroy any 1-hit projectile. However, this move has a lot of startup and it's quite unsafe on block so it's best to use this when you're not near the opponent. Boomerang (Hold B, F, Punch+Kick) - The boomerang goes through any non-super projectile and hits the opponent once forward and once on the way back. However, it doesn't travel the whole entire screen. EX Backflip (Hold D, U, Punch+Kick) - Slightly more invincibility and Simon tosses out an axe that makes the backflip do more damage. The axe itself travels in an arc and if this move is done in the corner, the axe falls towards the other corner. Flame Whip (F, DF, D, DB, B, Punch+Kick) - The whip sticks out for a longer period while engulfed in flames, making it do more hits and dealing more damage. Holy River (Level 1) (Hold B, F, B, F, Punch) - Simon drops a holy water bottle, it breaks and 4 flames appear in front of him. This attack reaches farther than his Whip Swing and cab be canceled from his Dagger Toss. This attack also needs to be blocked low. It's really easy to jump over these flames and Simon is left quite open while using this. Medusa's Wrath (Level 1) (Hold B, F, B, F, Select) - Simon summons about 5 Medusa heads that fly forward and wave up and down. These Medusa heads can be easily defeated with any attack and do weak damage. 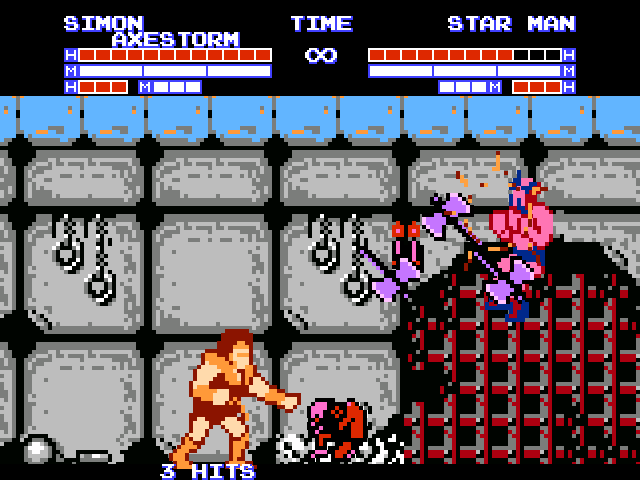 However, Simon still has complete control as they spawn but he's unable to use any move that uses up meter in the mean time. Simon can also be interrupted before the Medusa heads are summoned and he could end up wasting meter. Spawn of Death (Level 3) (Hold DB, DF, DB, U, Punch+Kick) - Simon takes out the invincibility potion, drinks it and Death appears on screen along with his scythes. These scythes will go after Simon until the potion's effect wears off. 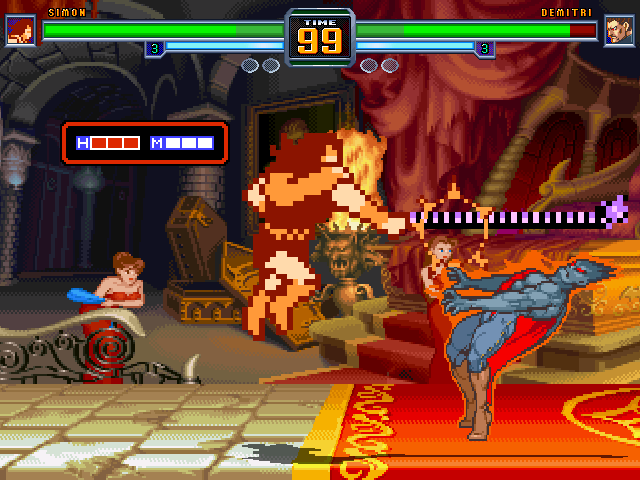 While Simon is invincible, he still has access to all his basic attacks but none of his specials can be used. This super itself does have quite a bit of startup after being activated so it's possible to hit Simon out of it before he drinks the potion (and waste all the meter he had). Red Skeleton behaves differently from other helpers. When you summon him (uses the entire helper bar), he comes up from behind and slowly walks toward the opponent. Once he gets close, he'll attempt to grab them (blockable) and bite them. If the red skeleton gets hit, he crumples and remains on the floor. During this time, Simon's assist power meter will refill and once it's full, Simon can resummon him (still requires the entire helper bar). The skeleton loses no health upon getting hit but the assist meter takes longer to recharge compared to the other helpers. So how about a new super for Simon? Hell yeah, Simon was my most wanted standalone release after Mario! Simon now has a standalone M.U.G.E.N version! He's scaled up (with a file to resize him back) and comes with a configurable file! He also has received several balance and mechanic changes that will be implemented into the next update of Famicom Fighters! Thank you very much for these updates to all the characters. 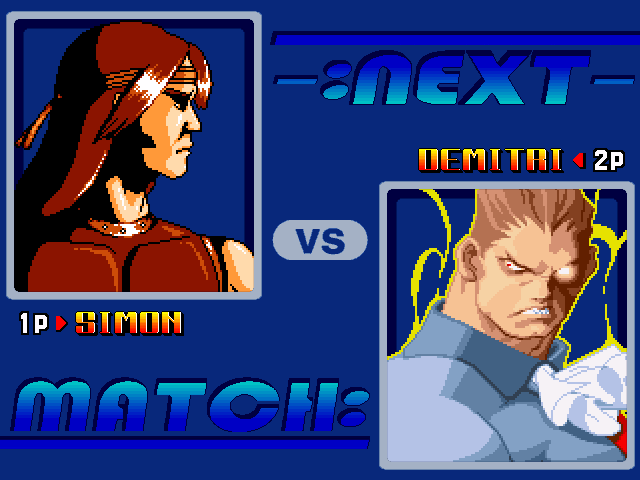 I especially like how the BGM only stops during their Round 2 victory poses or if their death has music. However, with this comes a minor inconsistency: The music still briefly stops if Simon KOs someone. It seems like that particular change hasn't been applied to him yet. Edit: Also, has nothing to do with Simon, but I found a small typo in one of Thonolan's quotes: "With ever loss, there is something to learn. I hope you figure it out." Thank you for the heads up, I'll get around to fixing that when I can!